In the centre of the Royal Bank of Canada Lobby, in the J.-A-DeSève pavillion. 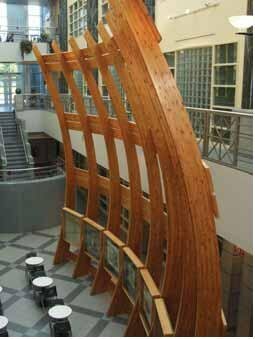 The structure is a reinterpretation of painter René Richard's boat. 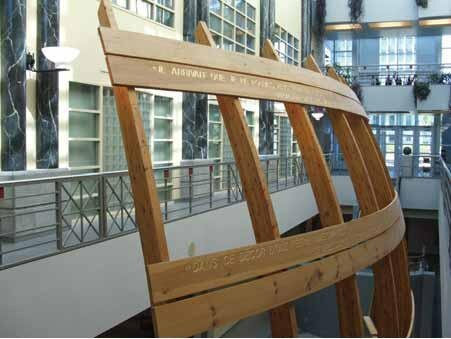 Quotes from the artist are engraved on the rear of the structure, in the upper part. Five paintings by the artist are also on display in glass panels hung on the bottom front of the structure. Il arrivait que je ne pouvais plus tenir en place; alors je saisissais mon canot et je suivais les bords des eaux pour ne revenir que quelques jours plus tard. Dans ce décor d'une féérie indescriptible se dressaient des grands troncs d'arbres jaunes comme de l'or, parmi des violets et des rouges. R. Richard, Ma vie passée. This artwork represents what was at the heart of the artist's life and work: the forest, water, freedom, travel and the Great Northern Quebec landscape. 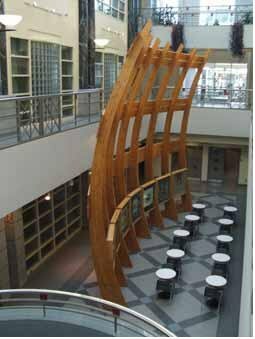 Competition (launched 1996) for students attending the École d'architecture (Faculté d'architecture et d'aménagement, Université Laval) who were registered with the studio of architectural composition.